The Jasper Deutscher Verein, Sister Cities of Jasper, Inc., and the Jasper Partnership Commission sponsored a German-American Day Dinner and Program on Tuesday, October 6th, at the Schnitzelbank Restaurant in Jasper. Over 95 individuals celebrated the occasion. who read Mayor William Schmitt's proclamation recognizing October 6 th as German American Day in Jasper. Dan Gutgsell, president of Sister Cities of Jasper, Inc., introduced the essay winners of the German Heritage in Dubois County essay contest which was held in conjunction with German-American Day. This contest was open to all seniors in the four Dubois County high schools. There were three essay topics. The students chose one of the three topics. They were "What does German heritage mean to me? ", "What can we, as the younger generation, do to help maintain and preserve our German heritage? ", and "Note local or family German names as they relate to the towns or villages that immigrants came from, the meaning of the family names, relationship to geographic location, occupation, etc." Over 65 entries were received. The winner from Forest Park Junior Senior High School was Kaitlin Emmert and her parents are Michelle and Robin Emmert. The winner from Northeast Dubois High School was Samantha Merkel. Samantha is the daughter of Doug and Renee Merkel. Kelsey Messmer was the winner from Southridge High School . Kelsey is the daughter of Curt and Mary Messmer. The winner from Jasper High School was Olivia Gutgsell daughter of Jim and Louise Gutgsell. Each student presented their essay as part of the program of the evening. Mr. Gutgsell noted that this is the seventh year that German American Bank has sponsored the German Heritage Essay contest and twenty six students have received scholarships totaling $6,500. Mr. Gutgsell also introduced Ms. Maureen Braun. Ms. Braun is the owner of Finishing Touches, a home and gift store in downtown Jasper, for over 30 years. She is a ROJAC board member on the membership committee. Ms. Braun received the Jasper Chamber of Commerce Community Excellence Award in 2008. Ms. Braun gave a very interesting program on ROJAC and the positive impact it has had on the City of Jasper and its citizens. Among the projects of ROJAC are the Jasper City Mill, Train Depot, the Brick Boulevard , and the Schaeffer Barn. The Spirit of Jasper train made its first trip to French Lick on August 29 th . Over 150 individuals participated in the event. Many people were along the train route and waved and cheered the train and its riders along its route. The Train Depot is being used more and more for meetings and gatherings and is a popular area for picture taking. The Farmers Market held in late spring through early fall is very popular on Saturday mornings. The train cars are available to be rented for non-moving events. The Schaeffer Barn has hosted several educational gatherings and a live nativity scene during the holiday season. An open house was held in the Jasper City Mill on August 1 st . Dieter Hahn, Mayor of Pfaffenweiler, presented the community with an advertising poster which originally hung in the Eckert Mill around 1900. The Jasper City Mill will house a visitors' center and gift shop. Ms. Braun encouraged all present to be an ambassador for Jasper and to purchase bricks to be part of the Brick Boulevard . Jasper is located between French Lick and Holiday World and is a relaxing place for tourists. The downtown area businesses have seen an increase in tourists and this benefits everyone. She was presented with a token of appreciation. Matthias Hilger, president of The Jasper Partnership Commission, presented the 11th annual German Heritage Award. This award is presented to an individual or group who has contributed generously of their time, talents, or resources in maintaining, improving, or building upon the German roots in Dubois County . Sister Cities of Jasper and the Jasper Partnership Commission created the award in 1999. The Jasper Deutscher Verein sponsored the award. This recognition is open to all people not just residents of the City of Jasper , who give what they can in order to make a difference. A nomination will recognize the work of those who generously support the German heritage. A committee, consisting of the presidents of the Jasper Deutscher Verein, Sister Cities of Jasper, Inc., and the Jasper Partnership Commission, judges the nominations and selects the winner. Mr. Hilger encouraged all present to continue to nominate persons who deserve the award. 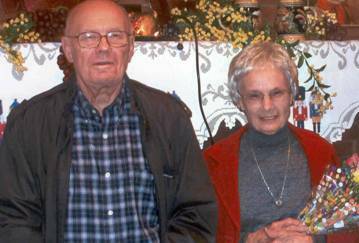 The 2009 German Heritage Award was presented to Vic and Monica Knies. Mr. Hilger noted that their personal involvement has helped establish, maintain, improve and our German Heritage. Mr. Knies' efforts have been vital in the coordination and continued grown of the partnership between Pfaffenweiler and Jasper for the betterment of both. Mr. Hilger stated "the Knieses background formulated the desire and willingness to assist in enriching German-related programs, organization and the Deutscher Verein to our community and county. Their primary goals have always been to encourage the continuance of our German heritage." It was noted that the Knieses "have given generously of themselves and are proud of how the German heritage they love has touched the lives of so many." Mr. Hilger thanked Lois Kuntz, Patti Goepfrich, Dan Gutgsell, Raymie Eckerle, and Al Bennett for their coordination in the evening's activities. Past recipients of the German Heritage Award are Mary Jo Meuser, Claude and Martina Eckert, Dave Buehler, Linus and Sally Lechner, Joe and Irene C. Eckerle, Dan and Linda Wehr, Leo and Lora Lou Eckerle, the late Lowell and Joan Glendening, Dave and Janet Kluemper, and Rafe and Phyllis Ackerman. On behalf of the German American Bank, Jay Baker, Senior Retail Officer, Sharon Burger, Vice President Retail Banking, and Laura Knies, Retail Support, then presented each essay winner with a $250 scholarship and certificate. Mr. Bennett thanked Rita Egler for attending the greeting table and congratulated everyone on a very nice program and presentations. Dan Hoffman has graciously agreed to conduct our Annual Auction of donated items with 100% of the proceeds supporting the Jasper High School German Exchange program. Everyone is encouraged to bring an item or two for this auction. Please be generous! Items donated in previous years have included baked goods, crafts, furniture, homemade wine and liquors, German items, Holiday items and even a whole hog! Be creative! The more variety and quantity of items we can have in the auction, the more funds will be raised to support the exchange program. Come prepared to have some fun...and to bid! Members with last names beginning A - P are asked to bring an appetizer, Q - Z are asked to bring a dessert. There will be a sign up sheet for the Christmas Dinner at this meeting. Fran Johnson will be creating a really great meal for us again this year. The cost is $10.00 per person. As usual the club will supply the liquid refreshments. Our program will be the Celebration Singers Christmas program under the direction of Larry Feldmeyer. As most of you know, this 75 - 100 member choral group presents a great program. Make plans to celebrate the Christmas season with your club! Reservations should be made for the Christmas Dinner by calling Al and Judy Bennett at 482-4275 by December 11 th . Members are encouraged to bring samples of their beer and wine for the annual competition. The categories to be judged are: Grape Wine, Non Grape/Other wine, and Beer. Let's have a great turnout! During the tasting, a table of various meats and cheeses along with soup will be provided by the club. In addition, we will be celebrating out 30 th anniversary as a club during 2010 and watching a Power Point presentation developed by the Jeffries family from returnable memorabilia such as pictures, letters, newspaper articles and remembrances supplied by you, our membership. If you can't supply the articles by email to green2414@yahoo.com , you can call 326.2414 or mail to Birnie Jeffries, 4495 E. Schnellville Rd , St. Anthony , IN 47575 . See upcoming newsletters for more details! Eberhard Reichmann passed away on October 16, 2009 at Hospice in Columbus surrounded by family and friends. He was born on Dec. 8, 1926 in Stuttgart Germany and emigrated to the United States in 1953. He completed his doctorate in German Studies at the University of Cincinnati in 1959, the same year he started his career at Indiana University Bloomington. Eberhard Reichmann taught at IU for 32 years, retiring in 1991. The retirement was in name only since he continued as an active scholar and teacher producing numerous books, articles and lectures mostly in the field of German-American Studies. Eberhard Reichmann was fully engaged in life. He was a talented musician, able to play several instruments. He was an excellent stylist in writing in English, German or his native Swabian dialect. As an editor he saw the publication of several books, rarely missing a phrase that was out of line or inappropriately used word. He served as the Chief Editor of the IUPUI Max Kade German-American Center and the Indiana German Heritage Society, both of which he was instrumental in founding. Together with his wife and collaborator for 53 years, Ruth Reichmann, he served the German and international community of his beloved Indiana in many capacities. During his long career at Indiana University Eberhard Reichmann gave decisive impulses to the field of German Studies. 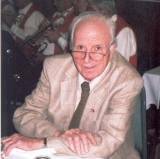 In the 1960s he served as Research Director for Improvement of the Teaching of German in the US and was founding editor of the significant pedagogical journal Unterrichtspraxis Journal for the Teaching of German. In the 1970s, as director of the Institute of German Studies , he helped bring about the recognition of German Culture Studies as integral part of a sound curriculum. In the 1980s he together with Ruth Reichmann saw the importance of the deep German background of Indiana and undertook to help understand and preserve that heritage. The Reichmanns helped fund an endowed professorship in German-American Studies at IUPUI, an example of their generosity and dedication. Eberhard Reichmann held many honors because of his considerable accomplishments. Among them are the Federal Cross of Merit First Class from the Federal Republic of Germany, the Sagamore of the Wabash , College Teacher of the Year 1990 from the Indiana Association of Teachers of German, the Distinguished Service Award from the Society for German-American Studies. He is survived by his wife, Ruth Reichmann, children Robert "Tony" Reichmann and Maria Reichmann Chapin, grandchildren Zachariah, Sarah, Elijah, Jeremiah (Lorna) and great-grandson Alexander. A celebration of life will be held November 18 th at 4 pm at the Athenaeum, 401 E. Michigan St. , Indianapolis . Gifts in memory of Prof. Eberhard Reichmann can be sent to Publications Fund, Indiana German Heritage Society, 401 E. Michigan St. , Indianapolis , IN 46204 or to the Hospice of South Central Indiana, Columbus. Eb and his wife, Ruth, were instrumental in bringing Jasper and Pfaffenweiler , Germany , together as sister cities. In the 1980s the Reichmanns realized the deep German background of Indiana and undertook to help understand and preserve that heritage. In early 1984, they visited Pfaffenweiler Mayor Fritz Gutgsell and helped set the community's sister city partnership with Jasper in motion. As part of the Celebration of Life for Eb on November 18 th , Norbert Krapf, Indiana Poet Laureate, will be reading a new poem in Eb's honor, "Eberhard Reichmann at Peter's Gate." The poem will celebrate the life of our dear friend who brought forth from the dark the Indiana German heritage to bask in the sunlight, with his unique mix of skill, dedication, wit, and gusto. If a member has an address change, even a temporary change, please notify Rita Egler at P. O. Box 15 , Jasper , IN 47547-0015 or call her at 634-9068. Let her know the dates of the temporary change and she will work with you so that you don't miss any issues of our newsletter. Any help you can give in maintaining postage costs is appreciated!!!! Hello everyone - Another month has passed, and so has half of the fall season. Margie and I have just returned from visiting our daughter in Augusta , Georgia along with a couple of days in Savannah . The German heritage and pride is alive and well in many communities throughout our great nation. However, it seems to me that it is a much more vibrant and outgoing pride that exists here in the Midwest . Margie and I know of the great German Strassenfest in St. Louis , Milwaukee , Cincinnati and Louisville and have attended some of these. These events lead me to believe that many of us love to eat and drink and be merry! Yea - I can get into that. As November approaches, we must be mindful of that memorable day - Thanksgiving! I know my family is living the American Dream and pray that your families are too. I've said many times that America 's worst days are better than the best days in most countries. It's true. I hope all of you remembered Veterans Day on November 11th and think about what that day means also. I'll see you at the November 19th meeting and lets all buy some stuff at the auction. We all need more stuff - right? On Saturday, November 14 th , from 10am-2pm at IGA, the 2009-2010 German Exchange program will have their first fund raiser. They will be selling hamburgers, cheeseburgers, and brats. Also for sale will be baked goods including cookies and cakes as well as Advent Calendars for $4. The German Exchange group will also be taking part in the Auction on November 19th. We will also have McDonald's peelers for Christmas stocking stuffers for $10, advent calendars for $4, and also IGA coupon books for $5. All items can be purchased at the time of the event or by contacting Erin White at Jasper High School at 812-482-6050. Looking for host family for Louis Steinle from Ehrenkirchen, a neighbor town of Pfaffenweiler . He goes to school in Staufen is 15 years old and will spend at the JHS the second semester of this new school year. Regarding the Family Picnic meal, just a few points of clarification; there were more hunters than Wehr and Hochgesang. Other Deutscher Verein hunters were Keith Bachman, Al Astrike, Ken Heim, Harvey Berger, Dave Prechtel, and Jim Corn. These folks all willingly left their wives and loved ones for the better part of many Saturdays in the pursuit of wild game to feed the hungry. Hunters endured cold, rain, mud and loss of blood from many brier scratches. Then they had to clean and dress the game; followed by a tailgate lunch of cold cheese and wurst and of course homemade wine. Feeling sorry for us on the coldest days, Gourmet Chef, Dana Bachman prepared one of her wild pheasant creations for us to warm up on. Friday afternoon, before the picnic, was spent by most of the hunters, along with Master Butchers Leo Eckerle, Ron Keusch, Rafe Ackerman going back over the thawed out rabbits; seasoning, etc. Special thanks also goes to Zena, Scooter, Katie, Bell and Rudy! Huntingburg Christmas Stroll - November 13-15, 2009 - Huntingburg 4 th Street Shopping District - Herald in the official start of the Olde World Christmas events and experience the joys of a Victorian Christmas. Enjoy unique specialty shops, a holiday home tour, carriage rides and a cookie walk. Ferdinand Christkindlmarkt - November 21 & 22, 2009 - Four locations: Ferdinand Community Center, Forest Park High School, Tri-County YMCA, and Monastery Art Studio - Step into 14 th century Germany with a visit to Ferdinand's Christkindlmarkt, which features live entertainment, free tours of Monastery Immaculate Conception, and over 100 lavishly decorated booths spilling over with quality hand-crafted items, antiques, folk art, food and wine. One of Santa's tiniest reindeer will make an appearance on Saturday and don't miss the popular live Glockenspiel performances. Other events include a Markt Bier Stube, Marionette Theatre, Stillpoint/Sisters of St. Benedict Concert and a special exhibit in the Monastery Crypt. Trumpeters herald the arrival of the Christkindl Angel on Friday evening, November 20, during a candlelit, outdoor ceremony. Enjoy the delights of Christmas at the markt, where admission is free and free transportation is provided to all of the event sites as well as other locations throughout town. Jasper O'Tannenbaum Days - December 4-6, 2009 - Downtown Jasper - Enjoy the bustle of Christmas activities centered around the city's enormous Christmas tree. Events include artists and artisan demonstrations in the stores, carriage rides, church bazaars and cookie walks. Visit the Jasper Train Depot for an artist studio sale and other events. The Dubois County Museum will feature Gingerbread Cookie Decorating and Christmas displays. For more information on any of these events, please call the Dubois County Visitors Center at 482-9115 or visit our website www.visitduboiscounty.com . At this time of Thanksgiving, let us remember the less fortunate of our communities. This would be a great time to make a donation to any organization helping those in need in our communities!!!! Your generosity will be appreciated! !